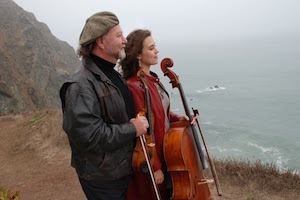 Consummate performer Alasdair Fraser and brilliant Californian cellist Natalie Haas will bring their virtuosic musical partnership to Pepperdine University's Smothers Theatre in Malibu on Sunday, January 13, at 2 PM. Over the last 16 years of creating a buzz at festivals and concert halls across the world, Fraser and Haas have truly set the standard for fiddle and cello in traditional music. They continue to thrill audiences internationally with their lively playing, their near-telepathic understanding, and the joyful spontaneity and sheer physical presence of their music. Fraser has a concert and recording career spanning over 30 years, with a long list of awards, accolades, radio and television credits, and feature performances on top movie soundtracks. In 2011 he was inducted into the Scottish Traditional Music Hall of Fame. Haas, a graduate of the Juilliard School of Music, is one of the most sought-after cellists in traditional music today. She has performed and recorded with celebrated artists in the fiddle world, including Mark O’Connor, Natalie MacMaster, Irish supergroups Solas and Altan, Liz Carroll, Dirk Powell, Brittany Haas, Darol Anger, Jeremy Kittel, Hanneke Cassel, and Laura Cortese. This seemingly unlikely pairing of fiddle and cello is the fulfillment of a long-standing musical dream for Fraser. His search eventually led him to find a cellist who could help return the cello to its historical role at the rhythmic heart of Scottish dance music, where it stood for hundreds of years before being relegated to the orchestra. The duo’s debut recording Fire & Grace won the coveted the Scots Trad Music “Album of the Year” award, the Scottish equivalent of a Grammy. Since its release, the two have gone on to record three more critically acclaimed albums that blend a profound understanding of the Scottish tradition with cutting-edge string explorations. In additional to performing, they both have motivated generations of string players through their teaching at fiddle camps across the globe.